DETAILS: Experience the luxury of a beach house and the convenient location and wonderful amenities of a condo with this wonderful WaterColor property. 1701 E County Hwy 30A #305 offers 1 guest bedroom, a spacious loft area, stunning gulf views, and beautiful accommodations for 6 guests. A relaxed ambiance greets guests inside this charming home. Modern, high-end finishes with subtle coastal décor elements make this property a perfect backdrop for your Watercolor vacation. An open-layout floorplan provides a spacious setting to relax with family and friends. The galley-style kitchen features gray cabinetry with beautiful brushed nickel hardware, granite countertops, and premium stainless steel appliances. The dining area offers seating for 4 guests, and the nearby living room boasts a comfortable queen sleeper sofa and two plush armchairs. A daybed with a twin trundle creates additional sleeping accommodations for guests in the loft area. Guests in the beautiful master suite will enjoy a luxurious king bed and a private en suite bathroom with a dual-sink vanity and a glass-front shower. The breezy, spacious covered balcony is a perfect place to enjoy the coastal sunrise with a morning coffee or the breathtaking sunset with an evening cocktail. The sugar white sand beach and sparkling emerald waters are a short walk away and invite you for a relaxing day of fun and sun. This home is equipped with two custom 360 Blue adult beachcruiser bikes, which offer a perfect way to explore WaterColor and its neighboring 30A towns. 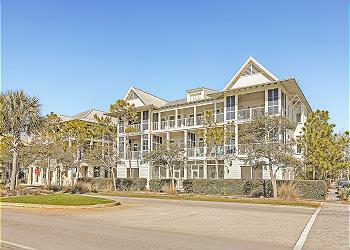 With an unbeatable location just steps from the beach and all of the local flavor of WaterColor, this condo is the perfect place for your family’s next 30A getaway. 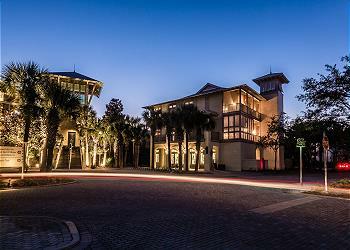 Contact 360 Blue today to book your stay in this incredible home! Enjoyed our stay. Great location with access to beach and shops. What an amazing review! We are so delighted that you and your wife enjoyed your vacation with us in Watercolor! We agree that there is so much to do in this area that it is easy to run out of time to do it all! We are very much looking forward to seeing you all again soon! Thank you for staying with 360 Blue! Lovely condo, great convenient location, clean, modern & updated kitchen & bathrooms. Comfortable beds and living room seating. The loft was perfect for our teenage daughter. Nice corner balcony for people watching. All appliances in working order. The Gulf is beautiful. Look forward to visiting WaterColor again soon. Looks like it was the perfect day to spend relaxing at the beach! We are thrilled you had such a wonderful stay in Watercolor! Thank you so much for staying with 360 Blue and be sure to come back and see us again soon! We had a wonderful stay in this beautifully done condo. My fiancée and I just recently got engaged (June 2018), our stay here was the perfect getaway to celebrate our new engagement and spend quality time together. The location was quiet and perfect, we will definitely be revisiting this jewel condo! Congratulations on your engagement! We at 360 Blue are so happy for you and your fiance and we are also thrilled that you enjoyed celebrating with us in Watercolor! We agree that this home is perfect for a fun and relaxing beach getaway! We hope to see you again very soon! We are so thrilled that you enjoyed your stay in this amazing home. Watercolor for spring break is such a great chance to relax and take in the amazing atmosphere. We loved having you with us and hope to see you back soon. We had a wonderful stay here and the unit is very tasteful and clean and nice. The corner balcony overlooking Watercolor is amazing! Little trouble getting checked in but it was fine. We are thrilled that you enjoyed your stay and we hope to see you back at the beach soon! We had a wonderful stay in this beautiful condo. The location just can’t be beat, and we loved all the artwork. We will definitely stay here again. There was a little bit of a mixup in getting our key card for the door of the building when we arrived, but the door was unlocked so we were able to get to the condo just fine. We are thrilled that you had such a wonderful stay and grateful for your patience as we worked through the issue with the key card. We sincerely hope to have you back again soon!